We will be back in the future! When we arrived at the Villa everyone was in awe of how beautiful the place really is. The pictures don’t do it justice! From the service of your staff, to the food and just the perfect environment, our stay was fantastic. On the morning of the 2nd day we already had friends asking when we were going to make plans to come back. 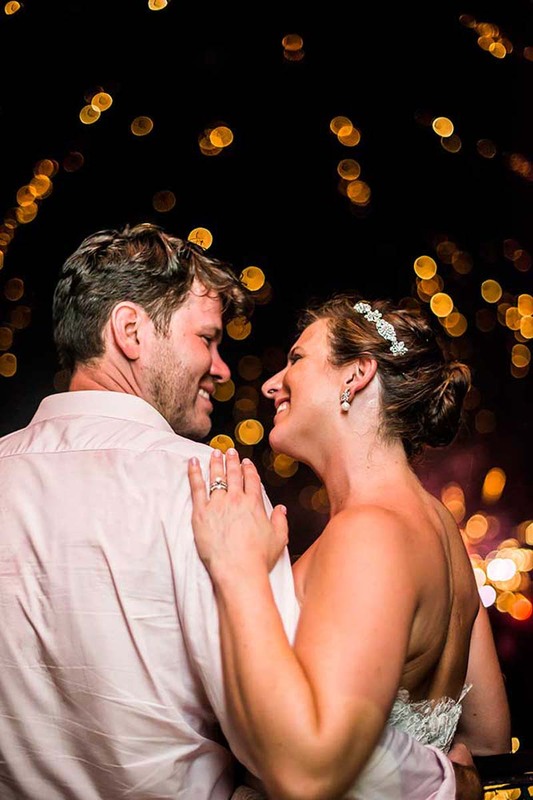 Our wedding day couldn’t have been more perfect and stress free for me. I appreciate every little detail and thing that was done to make the Villa even more beautiful. You guys do a great job with the facility and have an exceptional staff. Attached is a photo from the wedding day. I can’t wait to see the pictures Carlos captured. 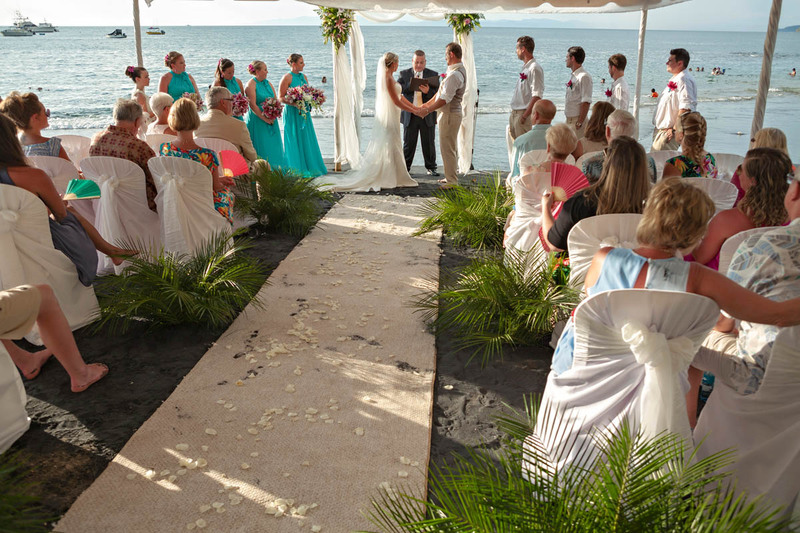 A Beach Wedding to Remember! 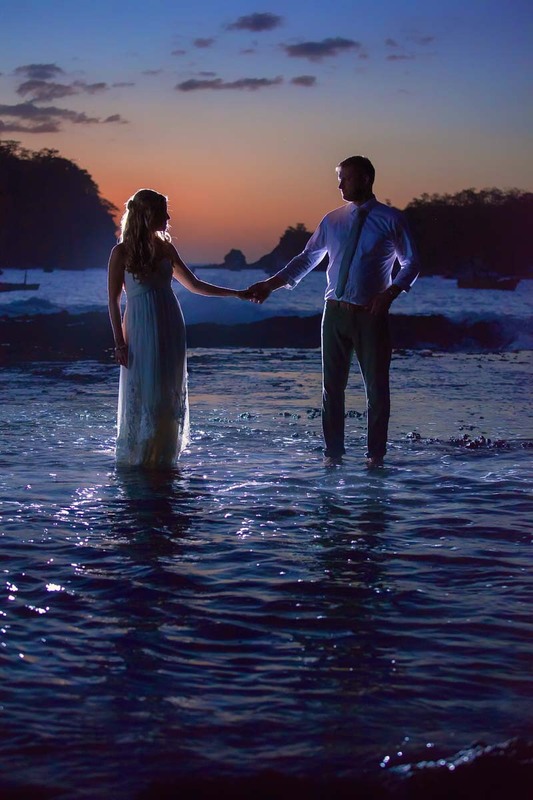 I have been trying to put into words to describe our wedding in Costa Rica…no words could ever truly encompass our overall experience. There is only one word that plays on repeat in my heart that even comes close to putting it into words…PERFECT. Everything about our special day was perfect. 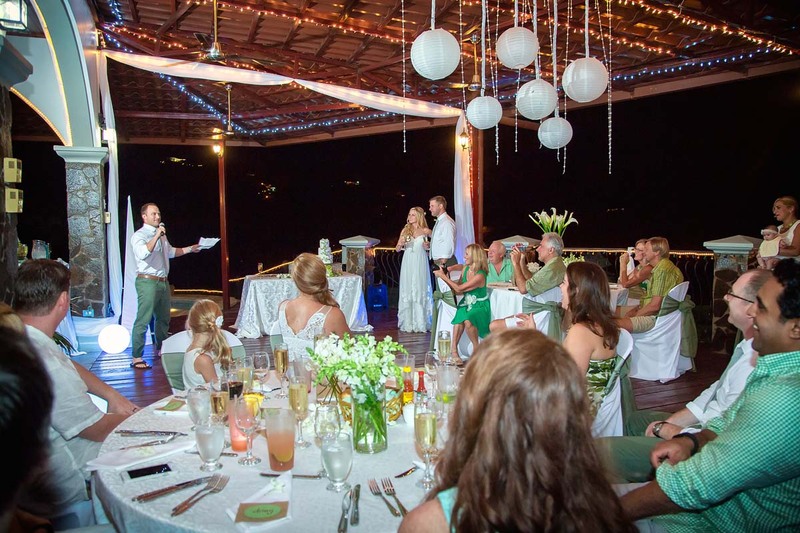 From start to finish, Barefoot Vacation Villas went above and beyond to ensure every detail was exactly as I had dreamed! 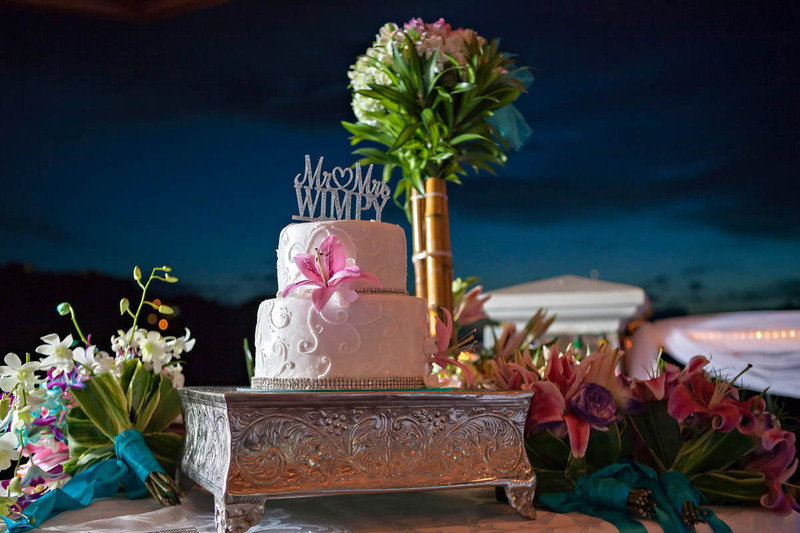 All great weddings start with the planning, usually with months and months of meetings, tastings, and lots of decisions. Watching my siblings get married locally, the amount of stress/anxiety they went through from planning and trying to pick the right location/vendor/cake, was a little overwhelming. 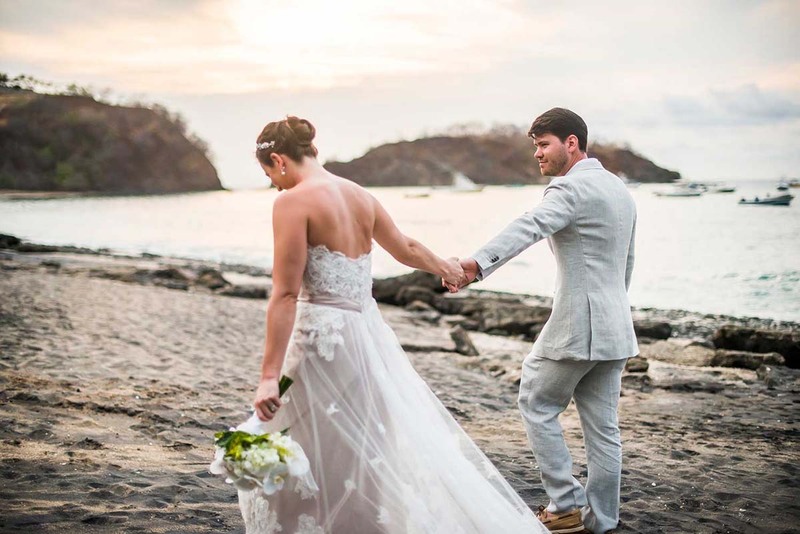 My experience getting married in Costa Rica with Barefoot Vacation Villas, was completely opposite of stressful and exhausting. It was the most enjoyable experience and almost unbelievable. Pinterest became my best friend to create a dream wedding board, that then translated into one email to Pam. Wonder Woman aka Pam and her team then went to work to create magic. I provided a guest list, description of what I was expecting and they did the rest. 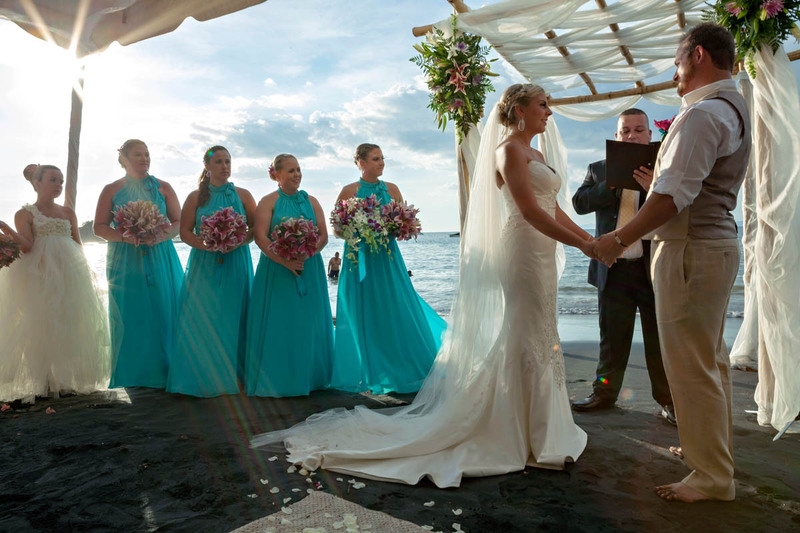 Our wedding, even with me providing pictures of what we wanted, we were still overwhelmed with the wonderful transformation that we saw at the Villa and on the beach. 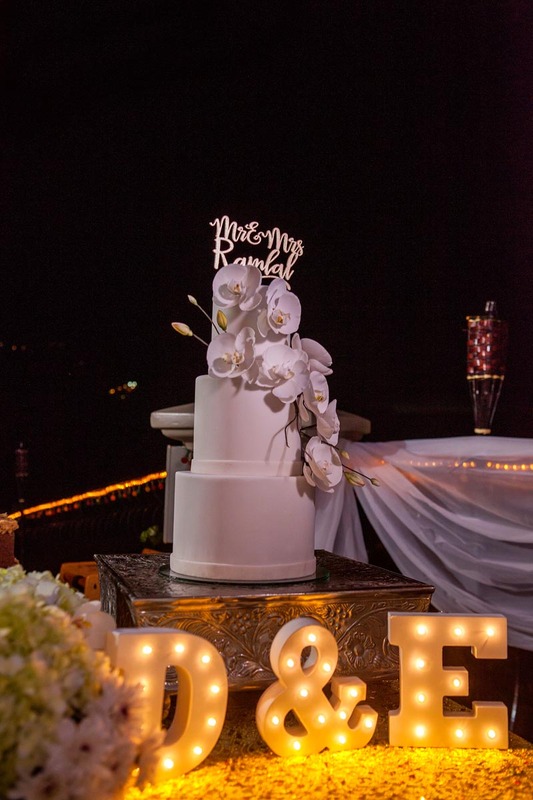 Not only did the decorations, flowers and cakes turn out better than we expected, the overall atmosphere just screamed LOVE. My husband and I were completely blown away by every single detail. 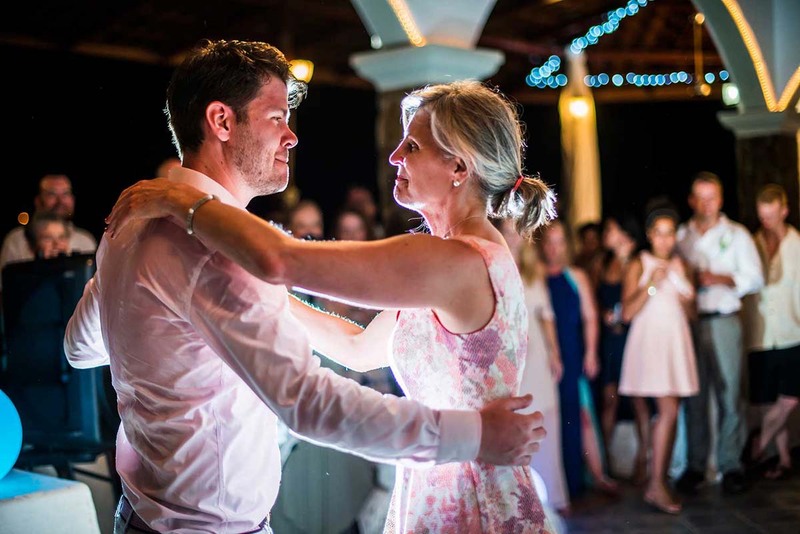 There is a lot of stress that comes on your wedding day, the team with Barefoot Vacation Villas managed to shield us from the stress and create a warm, loving and peaceful atmosphere. 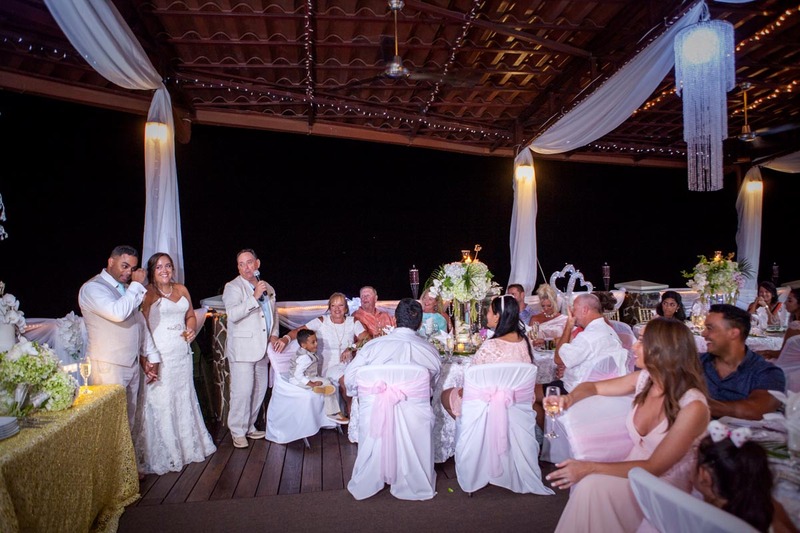 We had an intimate ceremony on the beach surrounded by our closest family and friends then celebrated with an amazing dinner and dancing at Villa Cascada. 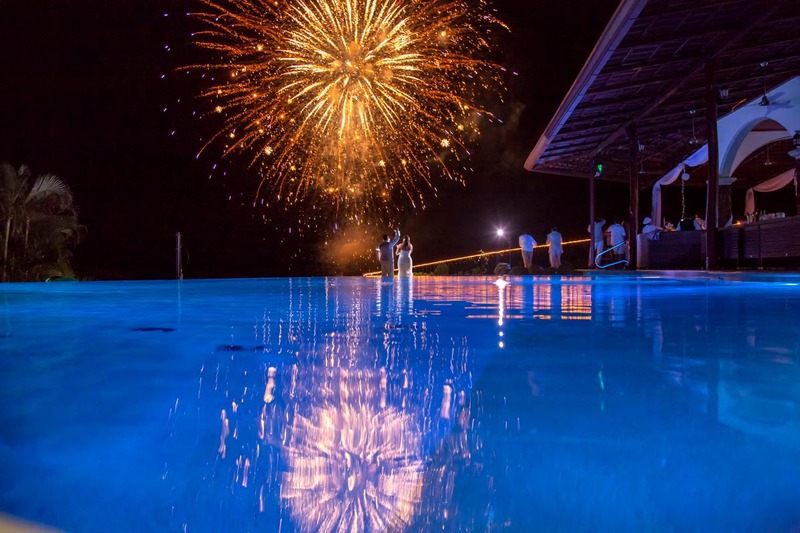 Our evening was topped off with a private firework show so close you felt as though nothing else in the world existed. My husband arranged with the DJ to have one our favorite worship songs play along side the fireworks, they both ended at the exact same time. 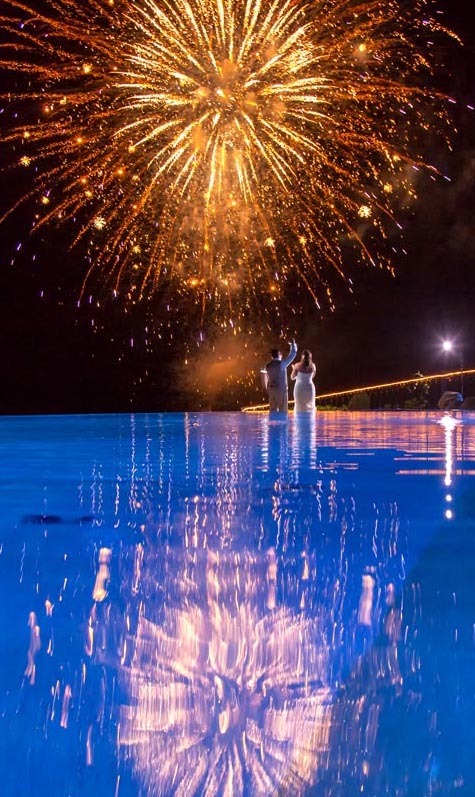 MAGICAL MOMENT! I get a tingle in my stomach and tears in my eyes when I replay that moment of sheer beauty and absolute perfection. 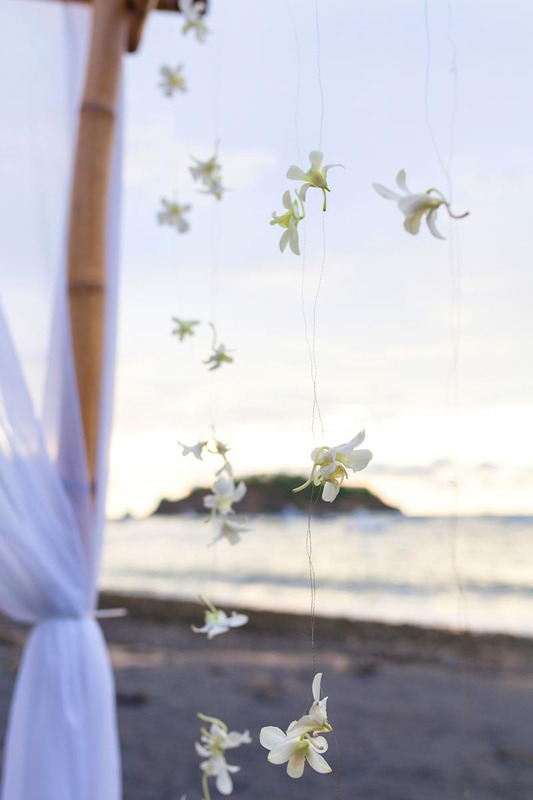 We would not change one single thing about our wedding or our wedding week. 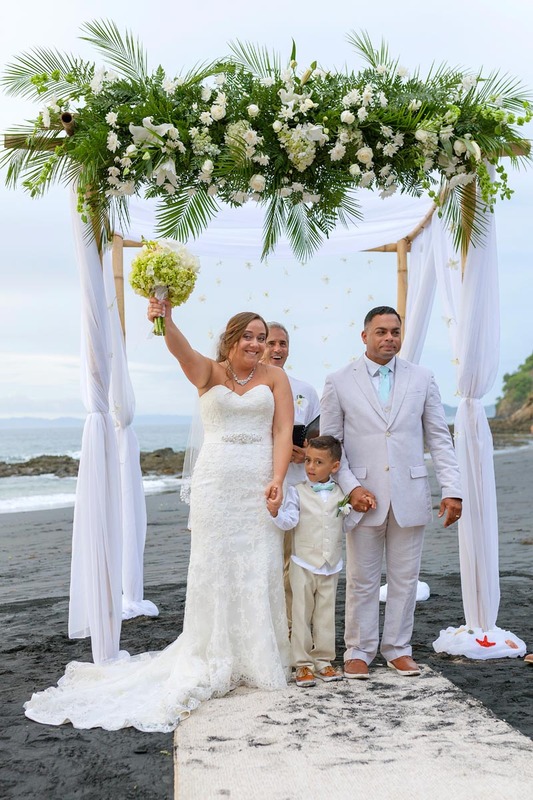 Costa Rica will forever and always hold a special place in our hearts, not only because beauty of the country but also because of the people. The staff at all the Villas become like family and you are sad to leave. The amazing treatment from all of the staff puts this place above and beyond any other hotel or vacation spot we have ever been to. Knowing this is a family business and they take pride in who they hire really shines through when you stay as a guest at their Villas! 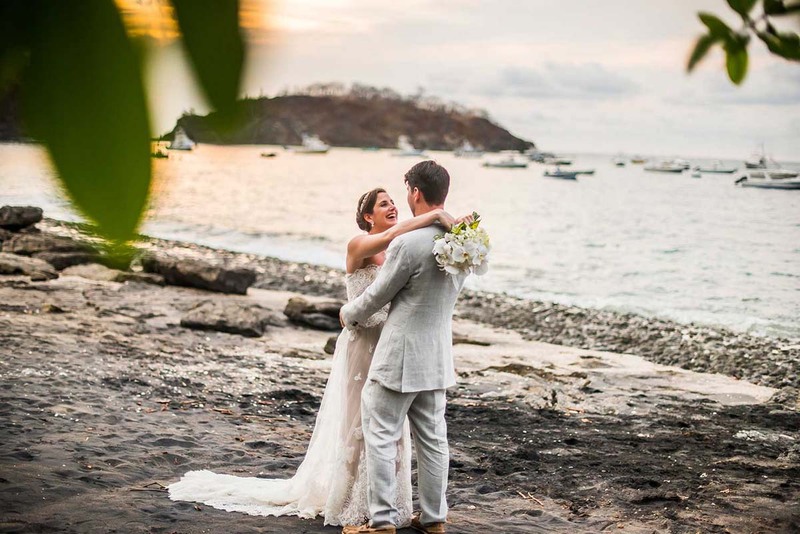 If I could urge any one contemplating a destination wedding, I would tell them this was the best experience of my life and would do it all over again. We cannot wait to return to the Villas and make more memories in such a wonderful place. 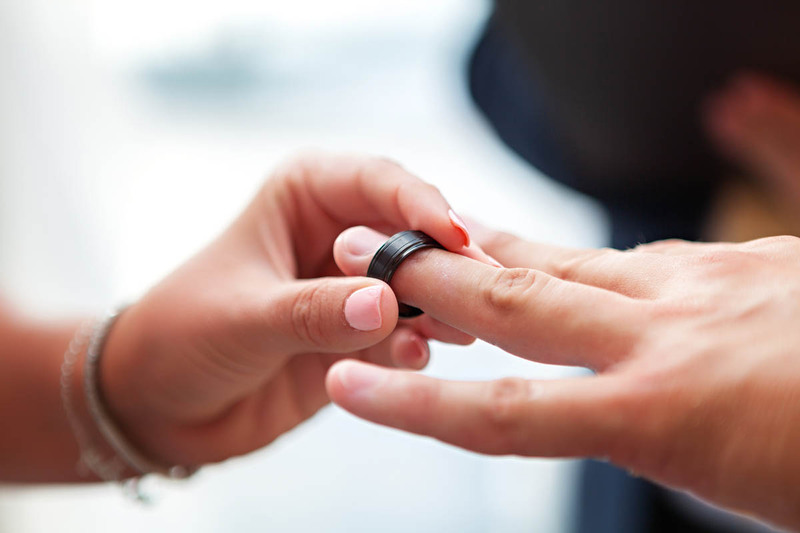 It is hard to believe that Kevin and I have already been married for 2 months. Everyday of those 2 months we have talked about when we can go back to Costa Rica! We can not thank you and Jack enough for making not only our trip, but also our wedding so spectacular! 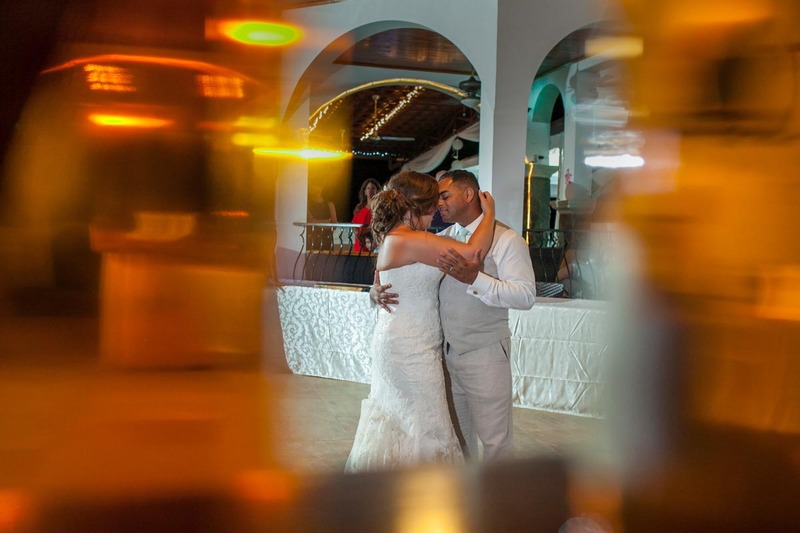 From the first time we met up to talk about having the wedding at Villa Cascada to each time we talked about trip details, you made it so easy! 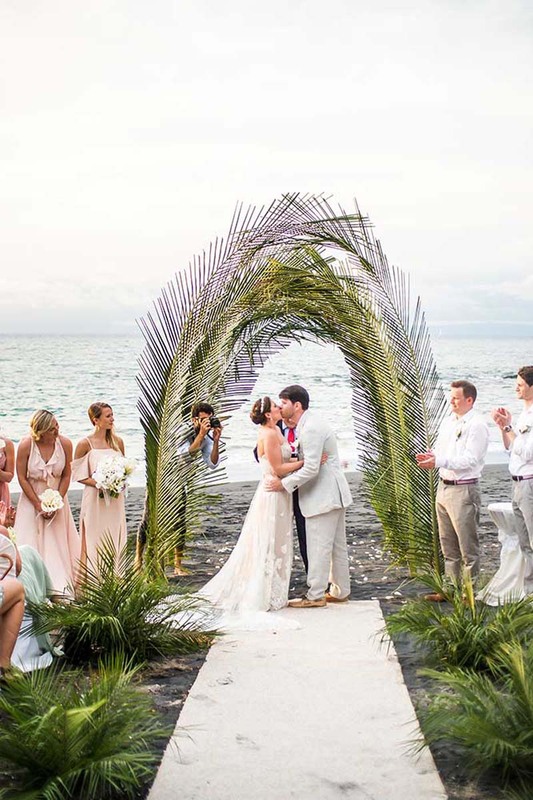 Everyone kept asking me how stressful it was to plan a destination wedding and all I could say was, “it’s not!” You made wedding planning so easy but made sure every detail was taken care of! I am so thankful I was able to enjoy and relax the whole week in Costa Rica instead of stress about last minute planning. 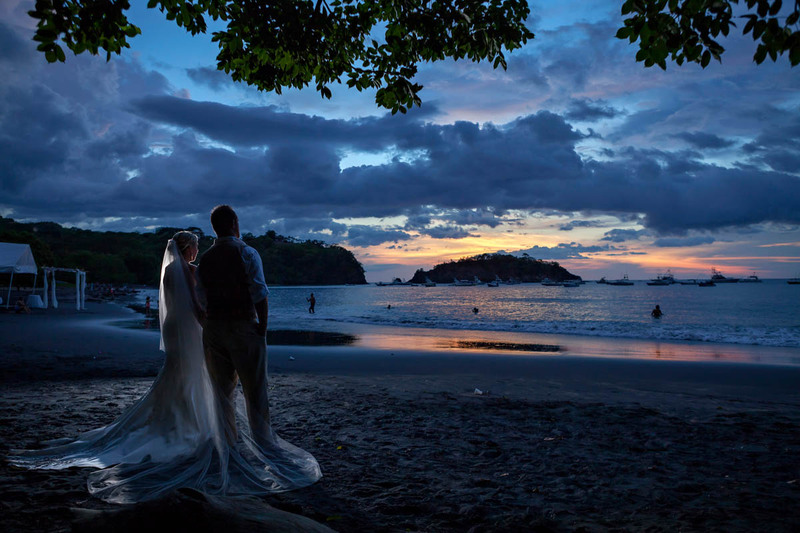 Villa Cascada and Villa Ocotal were both beautiful. Seeing pictures we knew it would be wonderful but we were blown away about how beautiful everything was. The rooms were beyond our expectations and having so much room for everyone to be in one place was fabulous! We were so excited to be able to have everyone we love and care about in one place for a whole week! 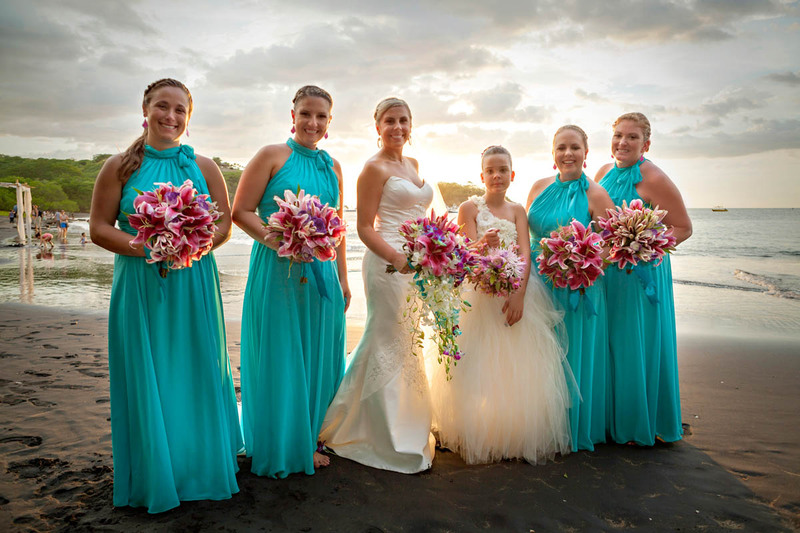 The staff at the villas were extraordinary! They took care of our every need with no hesitation. The food was all so delicious and they went above and beyond to cater to the needs of our guests with special dietary restrictions! Gabrielle was amazing! He made delicious drinks for the adults and the kids! He made sure everyone had a drink in hand at all times and made sure we had music playing! Guillermo was an angel. 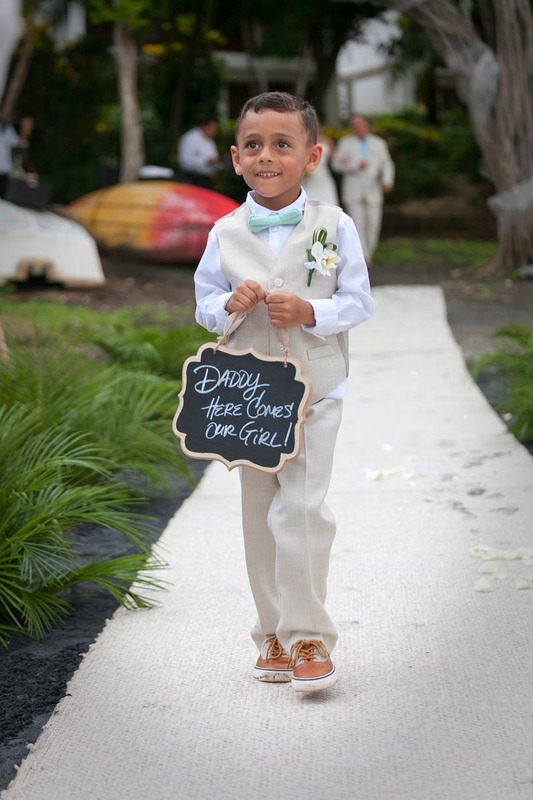 He made sure all of our guests had everything they needed and made sure every last detail of the wedding was perfect! He made booking and paying for excursions super easy and made sure everyone was where they needed to be on time (which I know isn’t easy with our group!) He fit right in with our crowd and made sure everyone was smiling and happy the whole week! 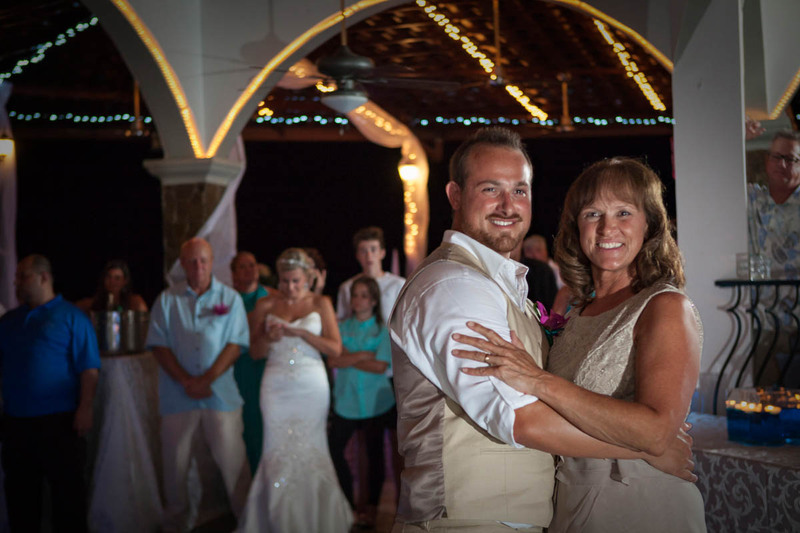 The wedding was more than Kevin and I could have ever dreamed of! 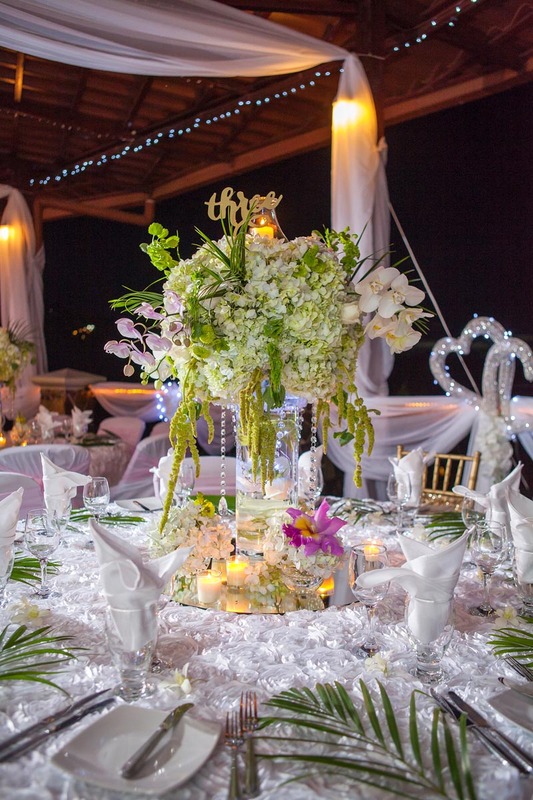 From the flowers to the food to the decorations, it was all perfect! 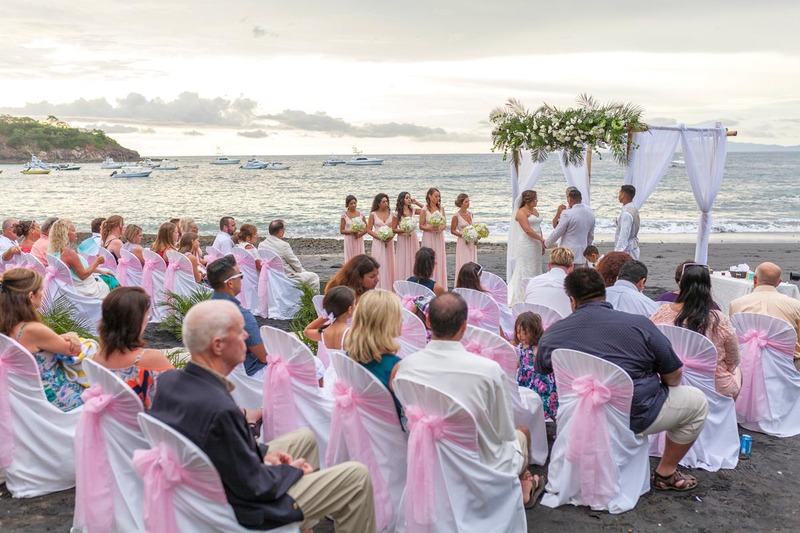 I knew getting married on the beach in Costa Rica would be amazing but this was more than that! I am beyond thankful to have had you to help make our day so perfect and special. 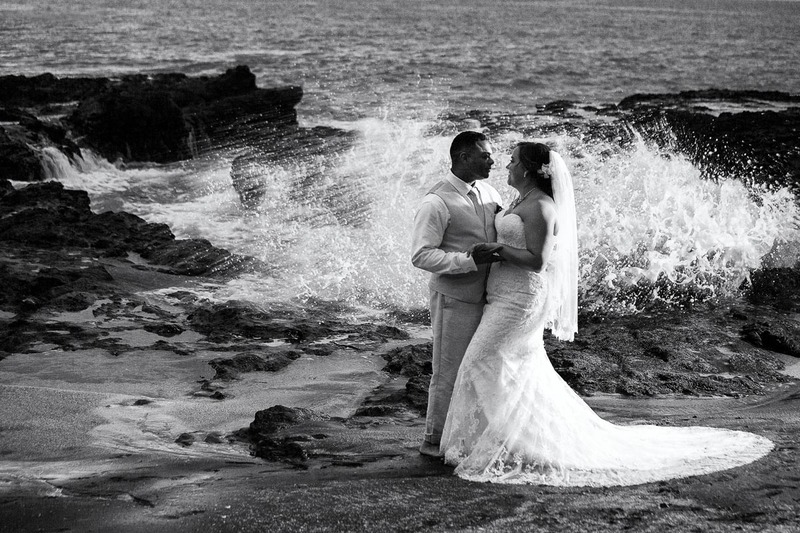 Kevin and I will never forget how beautiful our wedding day was! 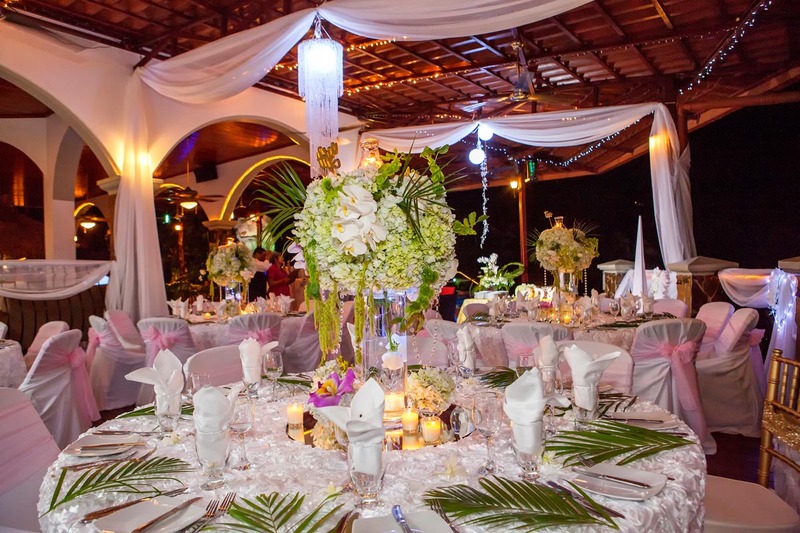 Our guests were all so blown away by Villa Cascada and the wedding. Everyone has talked about how that was the best vacation they had ever been on! 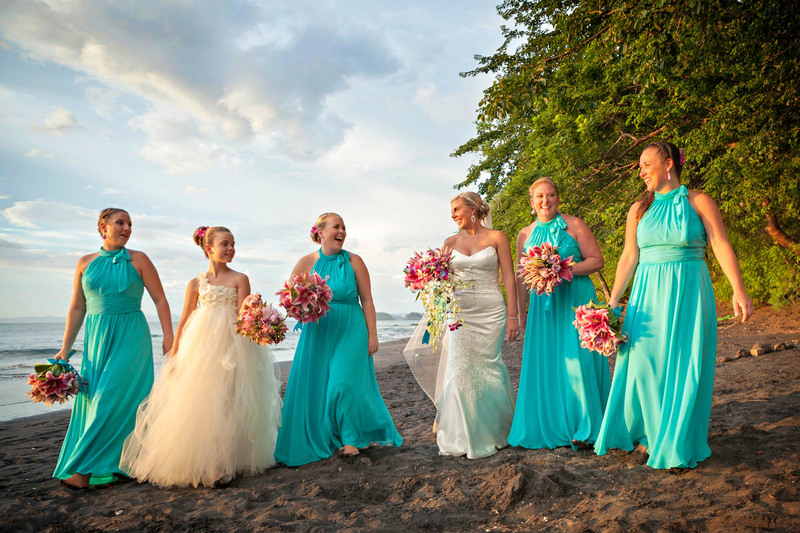 We all plan on making a trip back to Costa Rica as soon as we can! 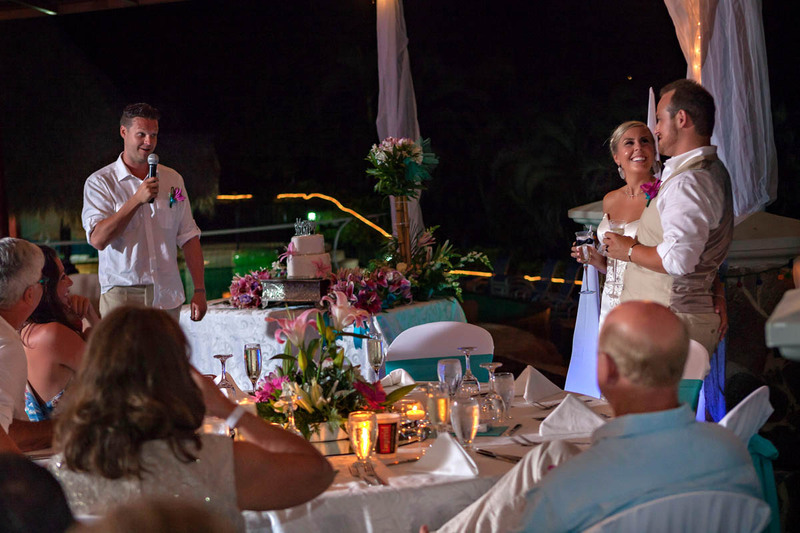 Thank you and all of the staff at Villa Cascada for making Kevin and my dreams a reality! 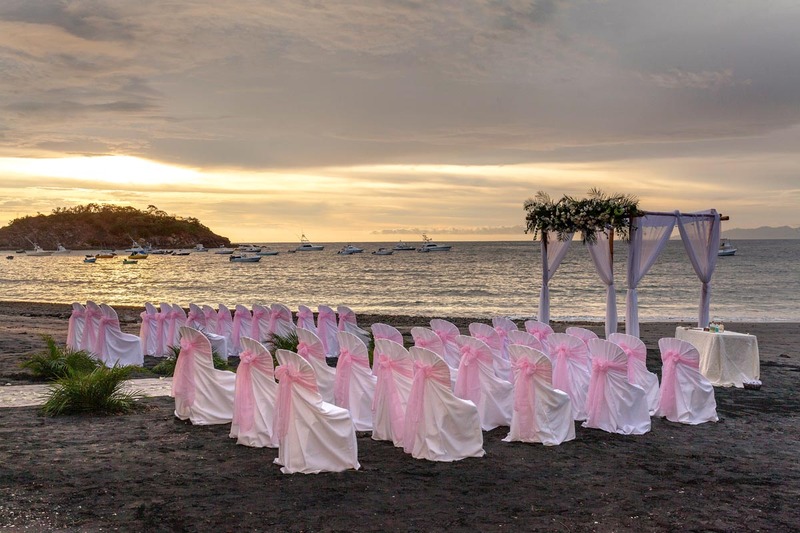 My daughter wanted to get married on the beach…. 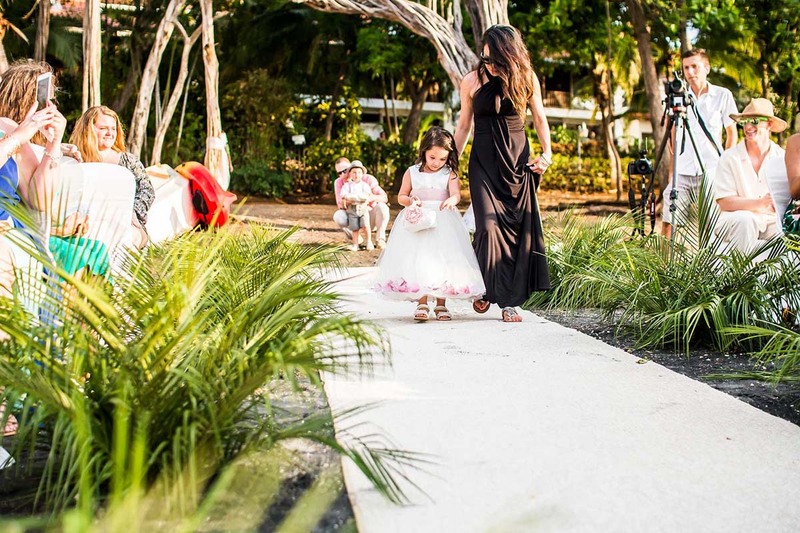 My daughter wanted to get married in Paradise…. 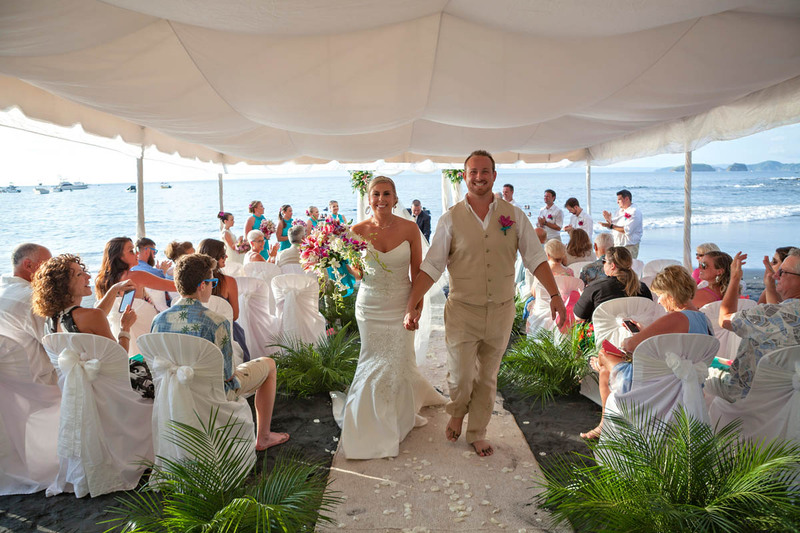 Barefoot Villas filled all of her requests and much, much more!! Planning the wedding from the States was a breeze. Pam took care of every last detail. Everything was handled when we arrived from picking up our entire party of 38 at the airport and back to everything in between. Guillermo (or the G-Man as we like to call him) and the staff at the Villas were incredible. The G-Man is all knowing. If we had a question, Guillermo had an answer. We never worried about anything, it was always handled for us. Gabriel and Ronaldo were the best bartenders. They were there when we got up with Bloody Marys and Mimosas and stayed until we went to bed after a nightcap. The food was absolutely some of the best we have had anywhere! The staff was very accommodating. We had several non-seafood eaters so they made other arrangements for them without ever skipping a beat! Breakfast was my favorite meal! We planned several excursions during the week, a River Boat Tour, Don Bosco, Zipline and a fishing trip. The G-Man handled all payments and transportation for us for each excursion. Our guest enjoyed them all. One of our favorite days was Friday before the wedding. 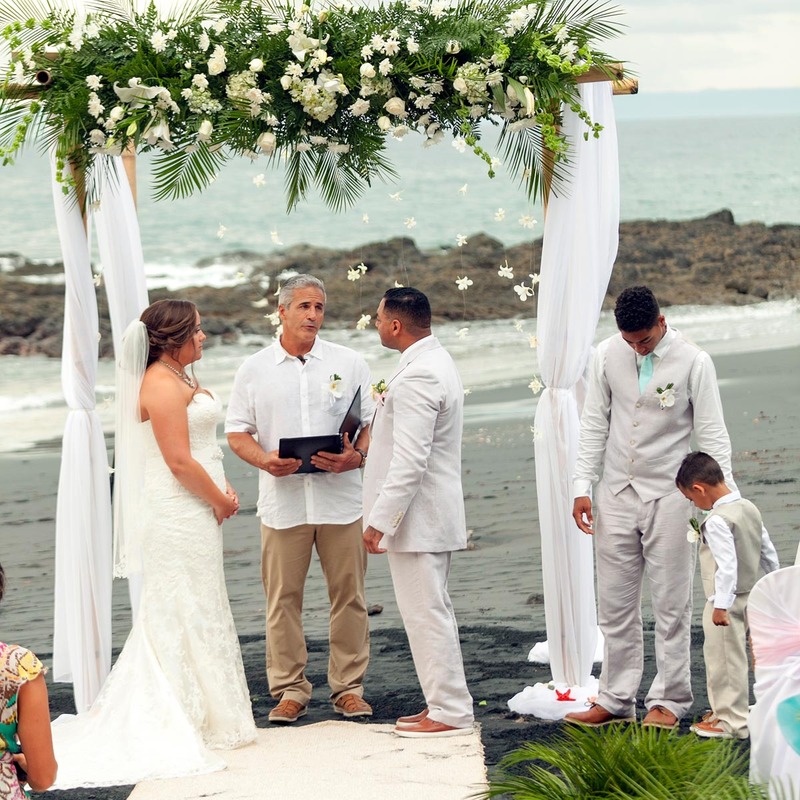 When it was time to go to the beach to rehearse the ceremony, Guillermo came and got the wedding party out of the pool, got a drink in their hand and we headed to the beach. Everyone commented that this is the best rehearsal they have ever done. It was fun and relaxed. 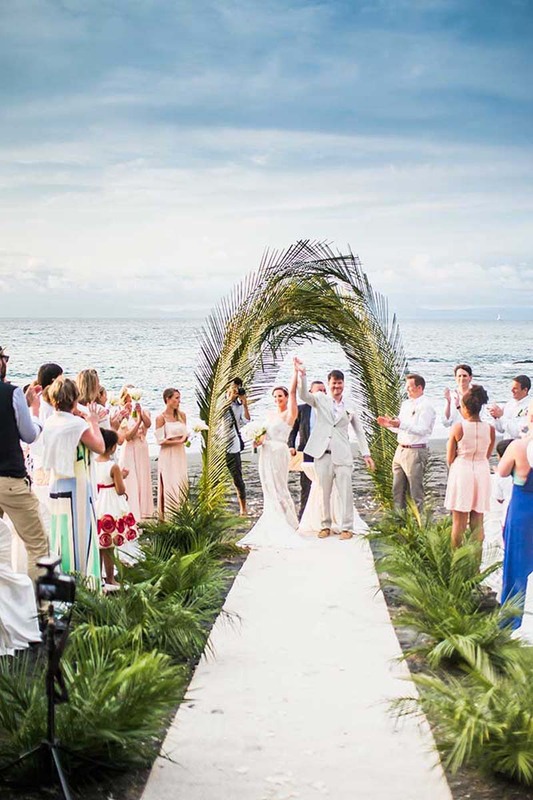 It put the bride and groom at ease! After dinner that night a Costa Rican band came and played for us. They were so fun! They passed out instruments for us to play. We even had Grandma and Grandpa on the cowbell and tambourine!! 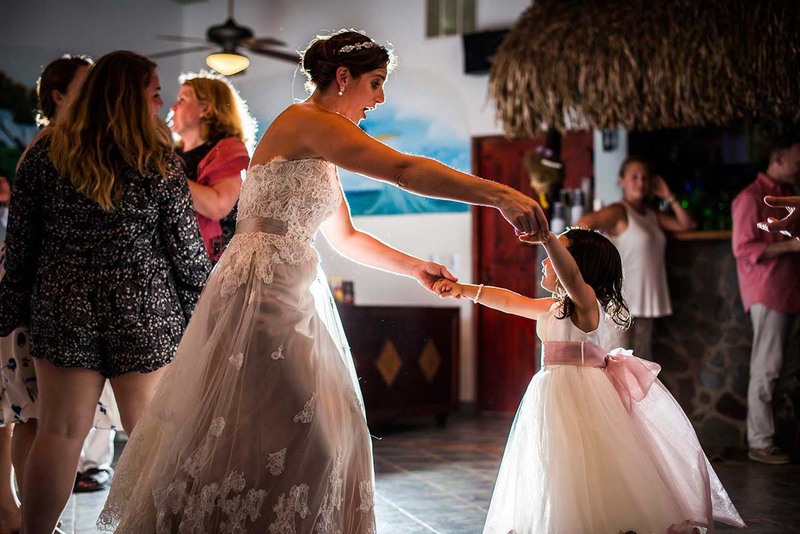 The wedding and reception was absolutely beautiful, just what my daughter wanted. 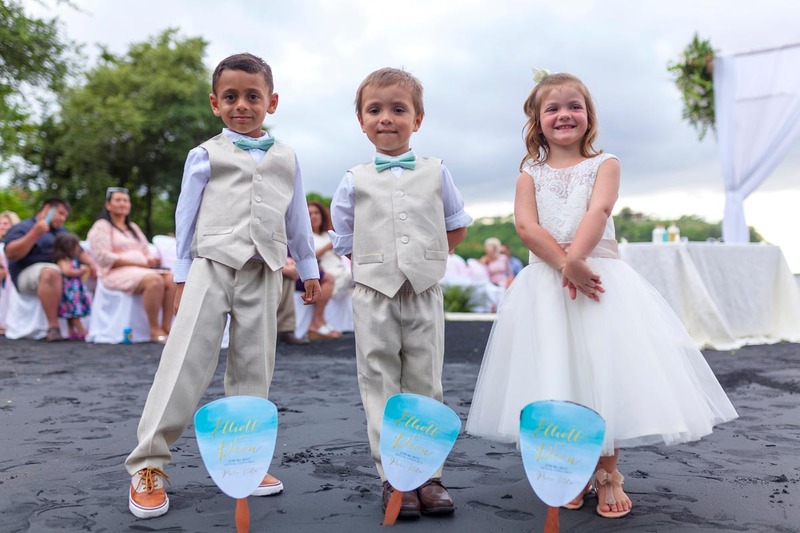 The wedding day went off without a hitch. One of the highlights of the night was the fireworks display!! Our entire party told us they had never seen fireworks so beautiful! Needless to say we received nothing but praise from our guest about what a wonderful week they had! 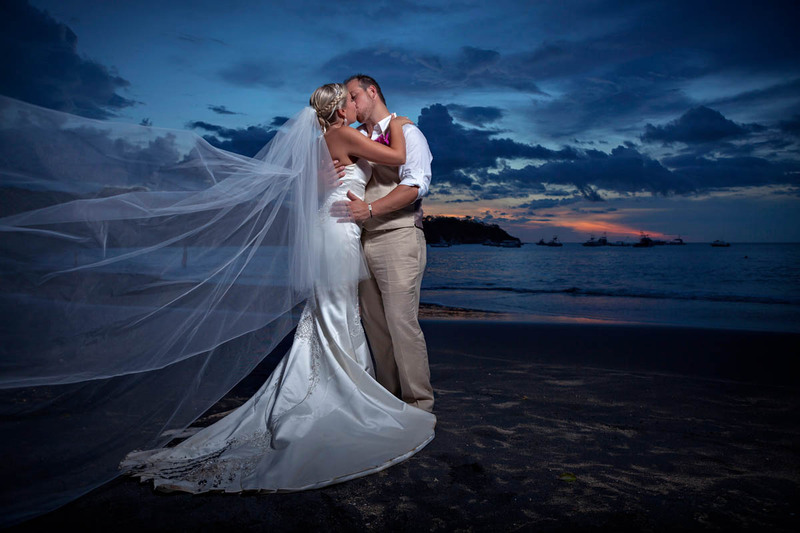 The entire experience at the Villas exceeded our expectations! 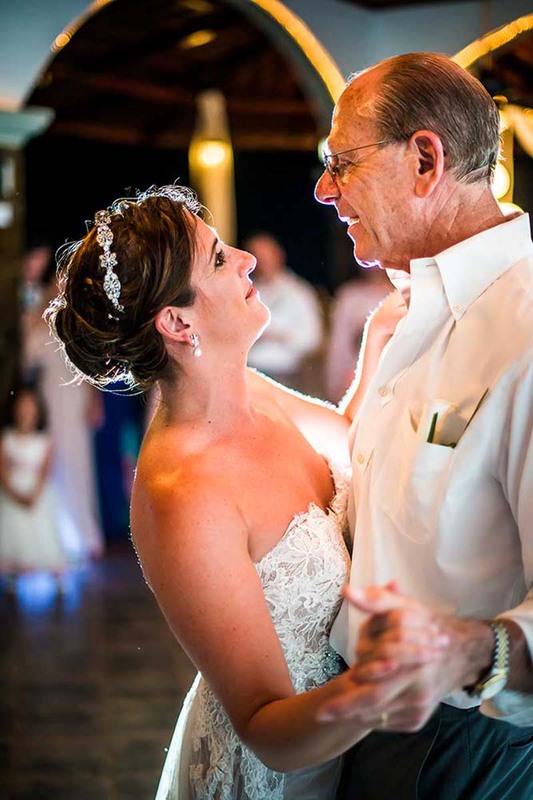 We cannot thank Pam and Jack and their staff enough for making our daughter’s wedding dreams come true! We cannot wait to return. We are already planning another trip very soon! 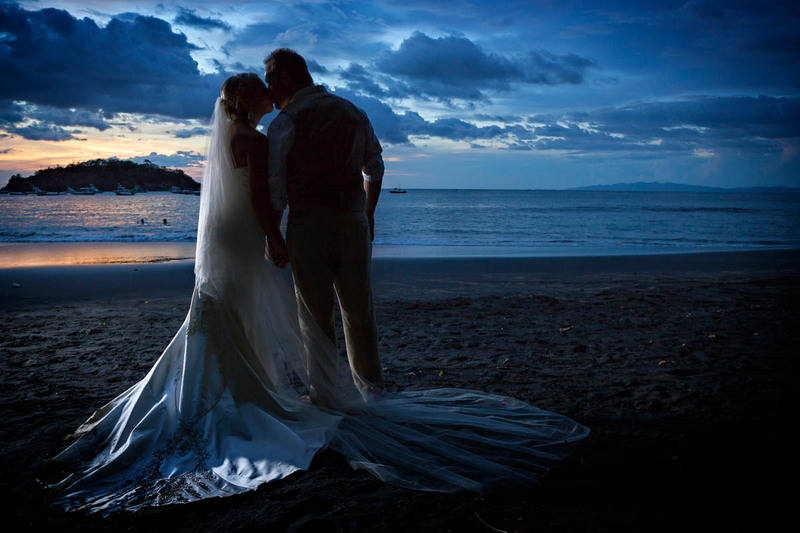 Destination Wedding in Costa Rica! 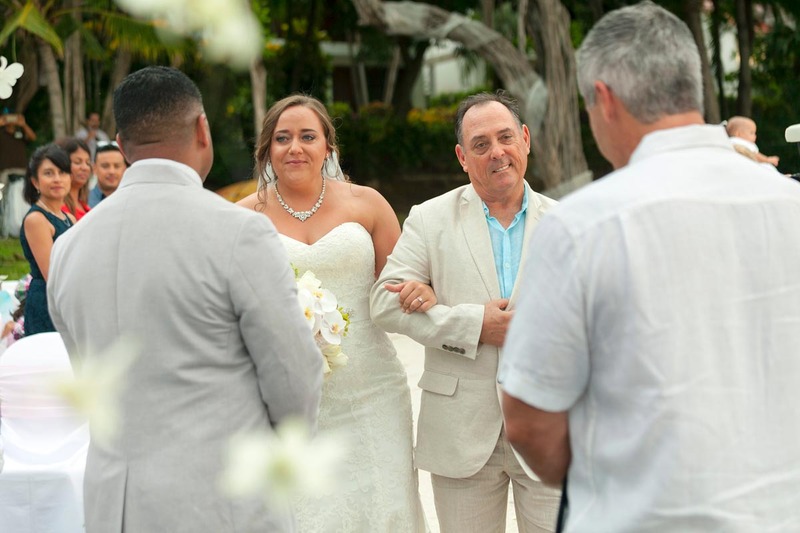 When I got engaged, I knew that I wanted to return to Villa Cascada for my wedding…but my sister had her wedding right here at Villa Cascada only a few years prior, and I did not want to copy her wedding….but it goes to show how much we love it here that she was thrilled to share her wedding venue with me! They wanted to go back! Pam is an angel sent from above! 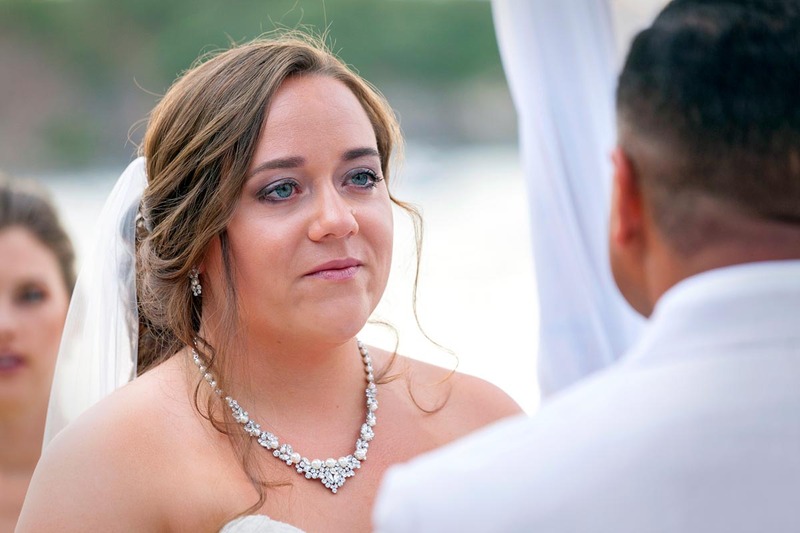 She helped with all my guests travel and flights, and helped me pick out options from the flowers to the tables to the rooms and connected me with all my vendors. She made it so easy! 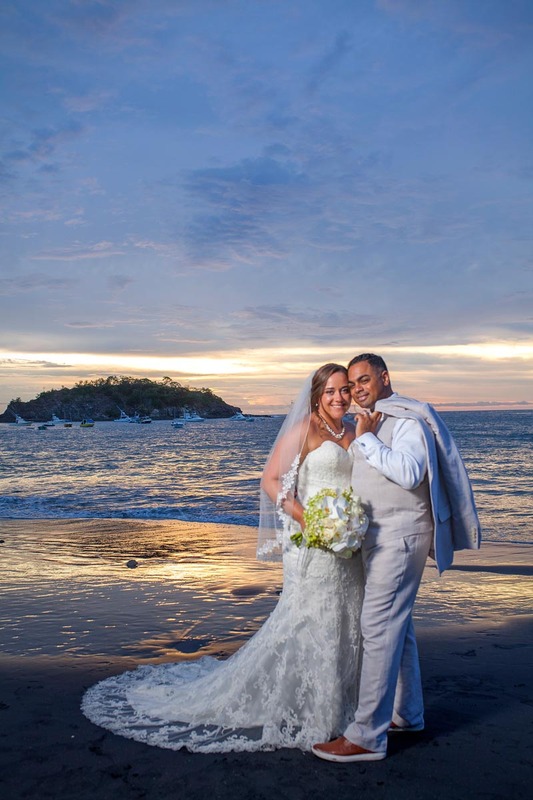 Guillermo is another angel….him and his house staff are kind and friendly and accommodating and I don’t know how they do that each week with a new bridezilla to deal with each time! 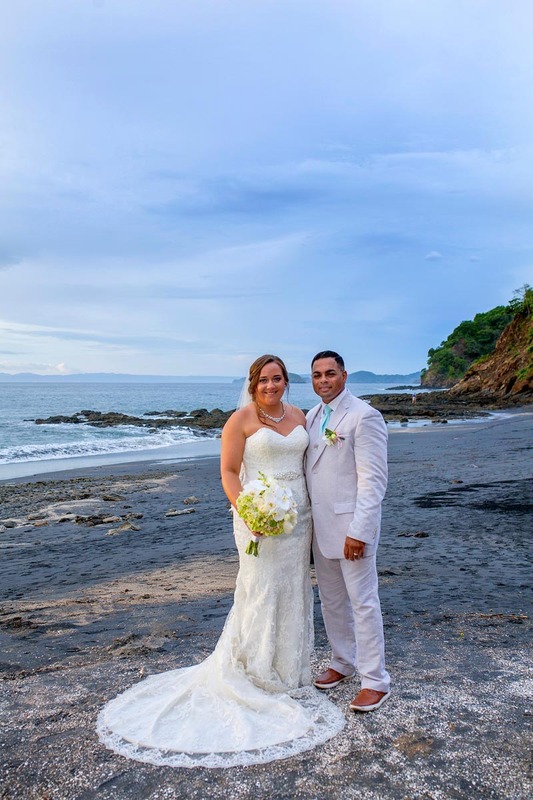 After two weddings here, our family feels at home at Villa Cascada and its because of Pam, Guillermo, and their staff. I have celiac disease, and they could not have been more accommodating! 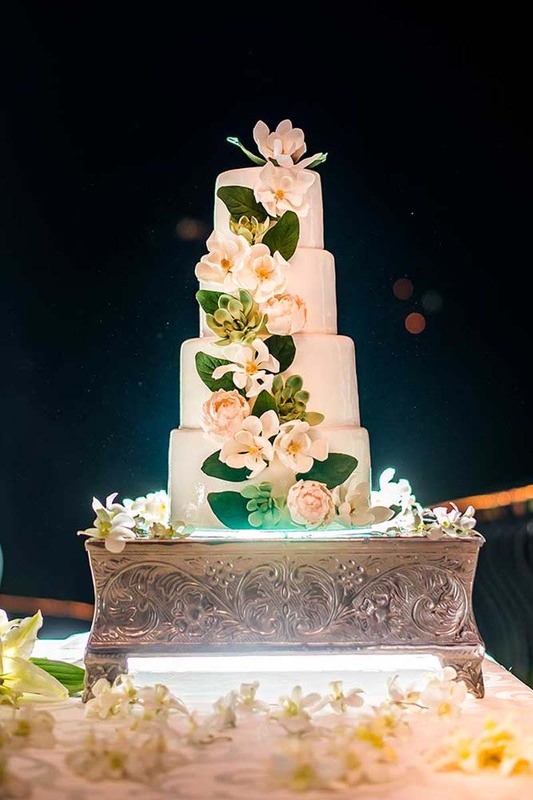 I even had a gluten free wedding cake that was GORGEOUS! Every meal I had options; they even have gluten free pancakes and croutons, and desserts! 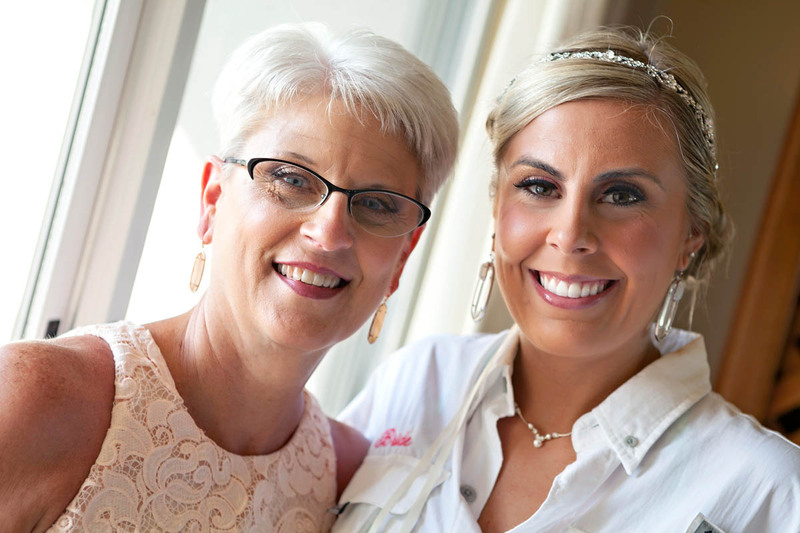 The food is so delicious, and all of my guests are still raving about it. 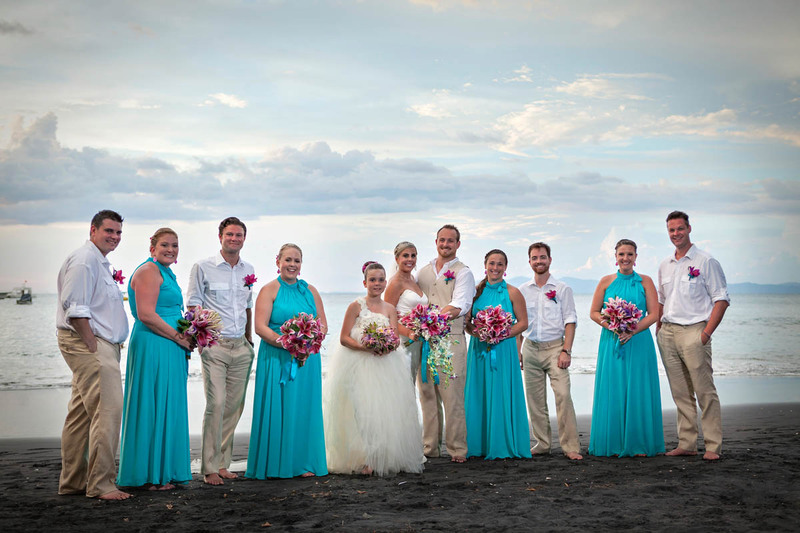 We’re back from our marathon wedding week in Costa Rica. It was, as I’m sure you know, a blur of parties and lots of fun. 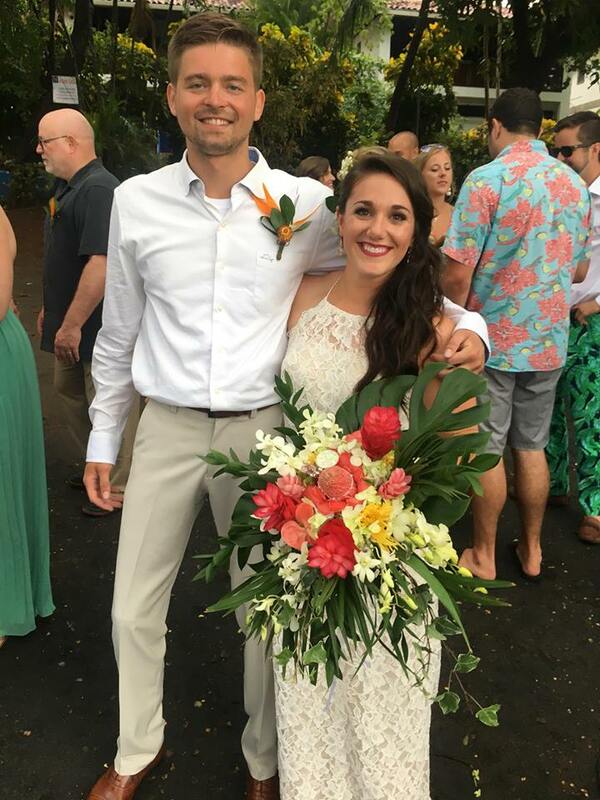 We wanted to take a moment to appreciate all that you and your staff did to make Julianna and Austin’s wedding week successful. Guillermo! What more can we say? He was an angel. 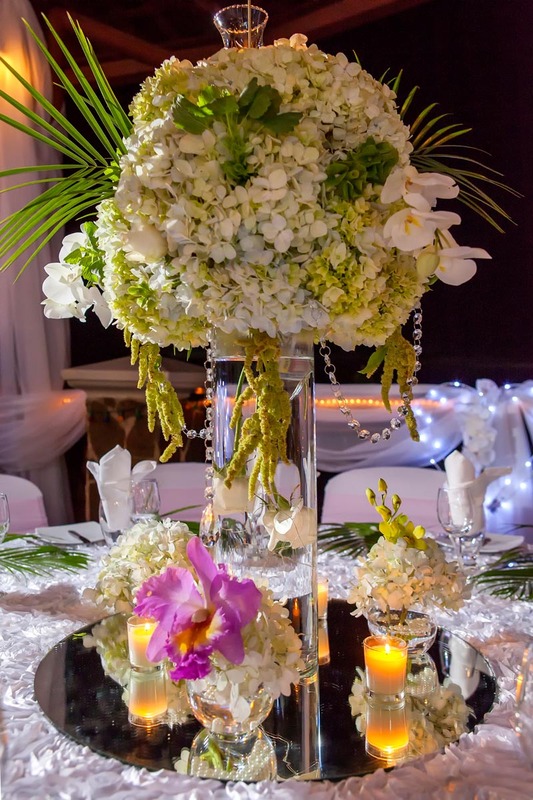 Ever ready to help, accommodate last minute requests, and manage his staff so efficiently. He is a jewel, and you are lucky to have him! I think he even stepped in to cook one evening when we thought we would go to Rooster’s and then only too late learned it was closed to a private event. We were ready to just do some easy quesadillas but Guillermo said “not on my watch!” and promptly heated up the grill! What a trooper! Your entire staff. It’s hard to know where to begin. Everyone loved the bartenders. Your kitchen staff was warm and welcoming. I never passed a maid in the hallway without a smile. Your pool guy is just wonderful and has an infectiously happy attitude! Everyone loved having the laundry done. I wish I could remember all the names of your staff, but then again, I wouldn’t want to miss anyone. They were ALL so very helpful. The setting. Couldn’t have been nicer. To have those views overlooking the bay was balm to our weary early winter souls. Just a beautiful location. The food. The Costa Rican dishes were delicious! The shrimp and beef kabobs the first night set a high bar of tastiness. Anything with shrimp was devoured (cooked to perfection). Everyone loved the tortilla soup. Of all the meals, I think breakfast was especially popular — and the beans and rice with shredded beef at breakfast were yummy. The fresh local fruit was incredible. I am still drooling thinking of that pineapple! My sister-in-law especially appreciated that there were so many “native” dishes and that the menu wasn’t just typical North American fare. The surprises! The piñata! 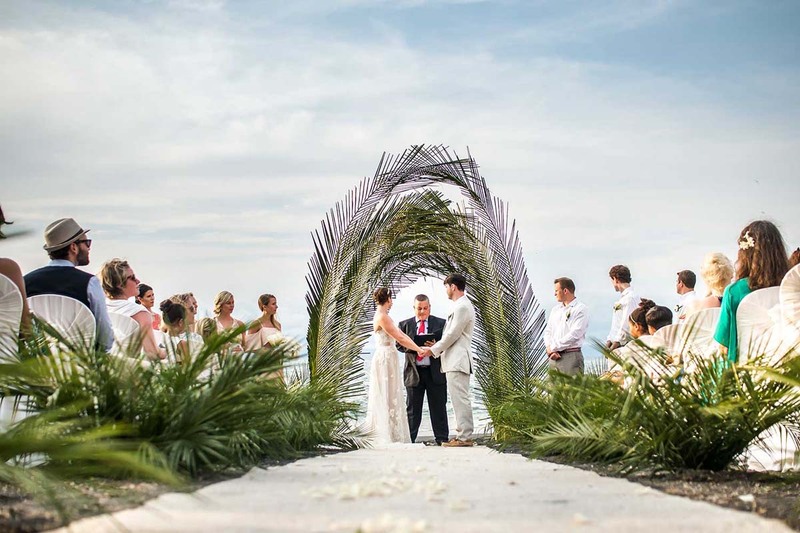 The local woven straw fans & headpieces! The Mardi Gras bags at the wedding reception! 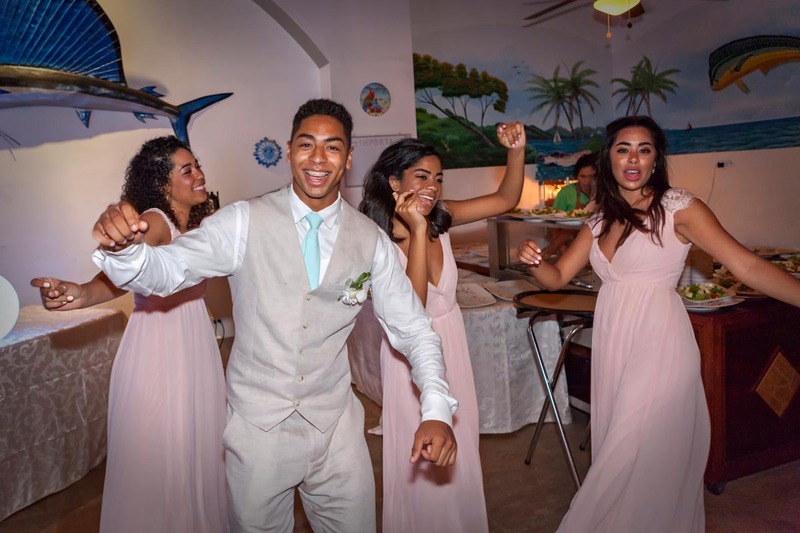 Jack certainly captured the spirit of our group of party-loving family and friends. Thank you so much for these unexpected experiences that added to our fun! Everyone had a marvelous time – and the offsite excursions just added to the experience. 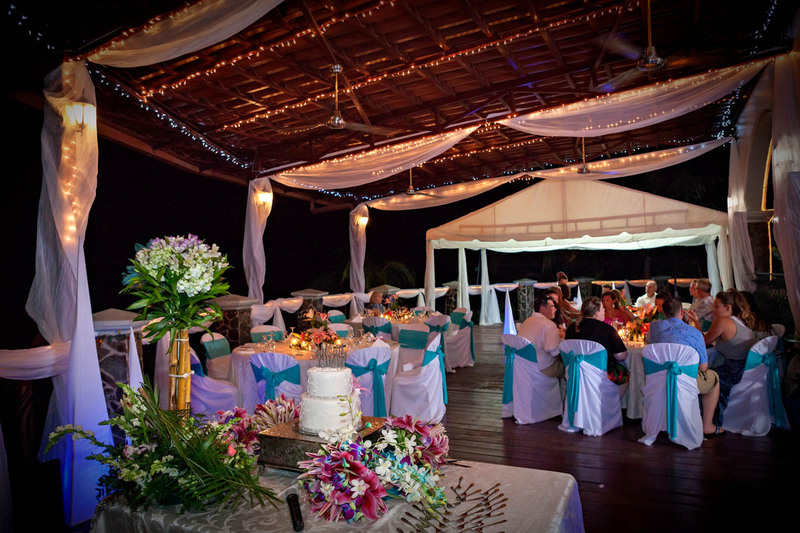 The sunset sail, zip-lining in the jungle canopy, ATVs, jet skis – a little bit of everything! 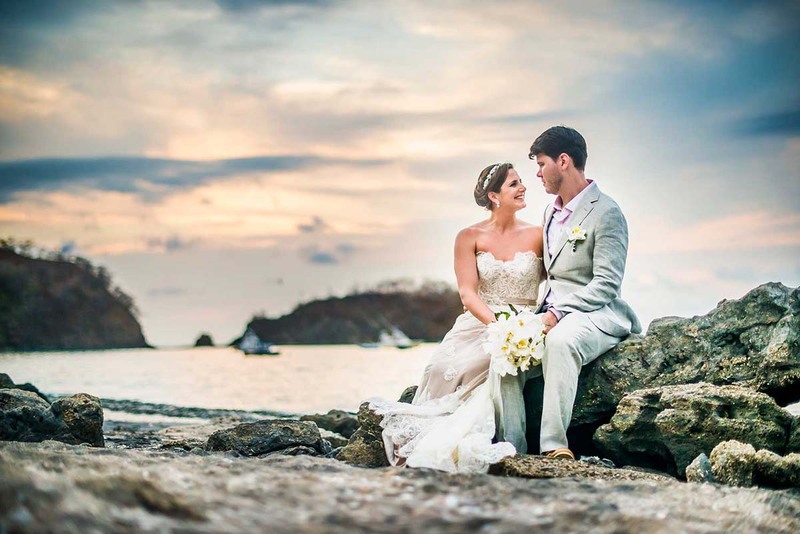 Thank you for everything ….Pura vida! I cannot thank you all enough for the BEAUTIFUL wedding. 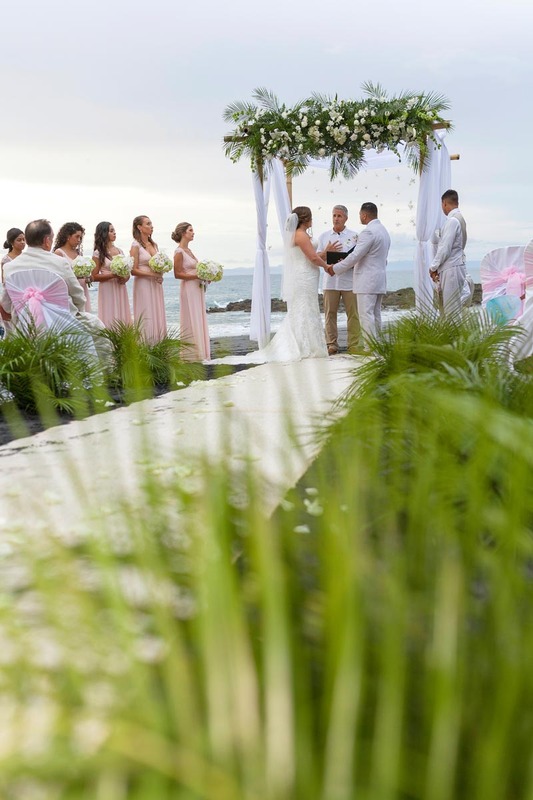 Every detail was perfect and Guillermo set all my extra little bits and pieces up perfectly. 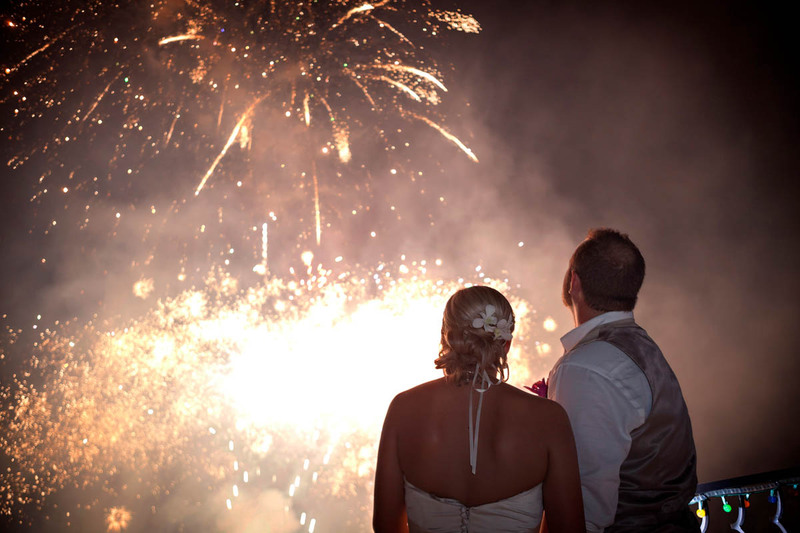 The fireworks were timed just right, and you were correct, everyone was blown away by them. The bad part about our wedding is now we can never go to a normal wedding ever again, they will all be disappointments! My cousins are also worried about how they could possibly top our wedding 🙂 My uncle was tickled that the wedding involved a game of late night pool volleyball, which he got into! Two guests are ready to move to Costa Rica, aside from us. The whole week was so amazing and the staff were a huge part of that. The food was fabulous and they accommodated food allergies perfectly. 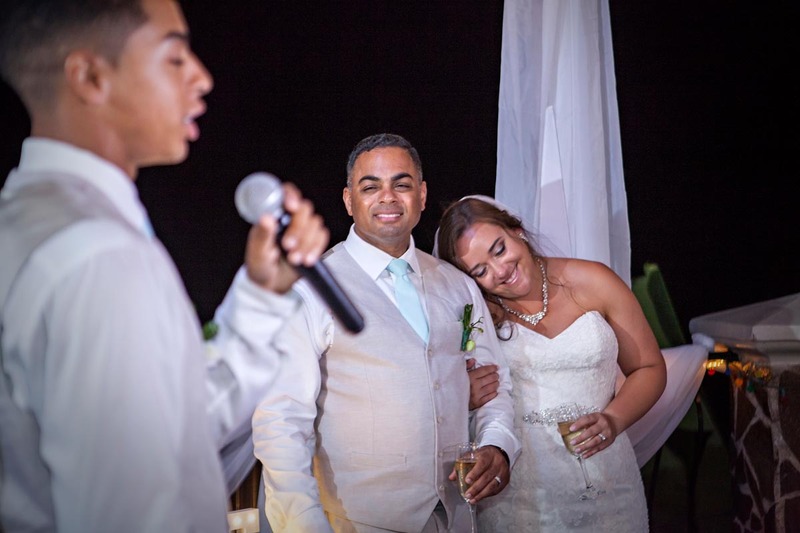 Thank you for all you have done to make our week and certainly our wedding special. It was the trip of a lifetime and the perfect start to our lives together. I won’t have pics back from Toh for a month or so, but till then if you google #happilyeverstastny you can see some of the pics our guests shot from both the wedding and the trip. 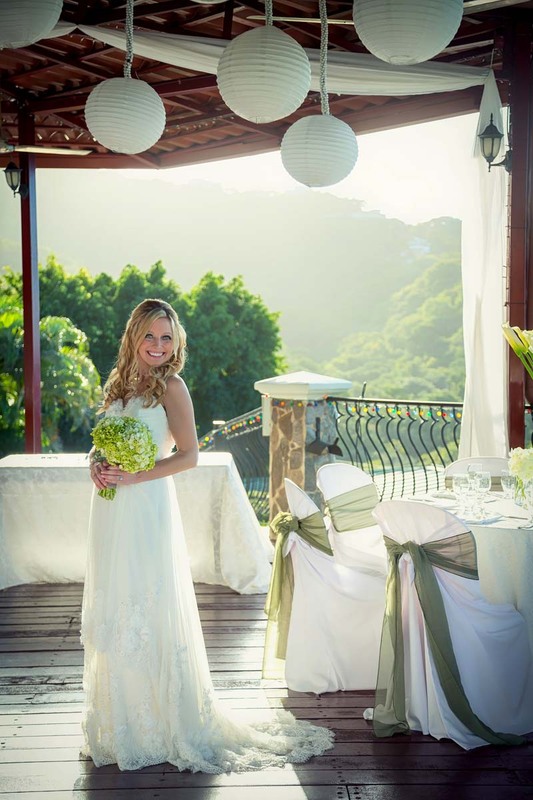 I had my wedding at Villa Cascada in April, 2014 and I simply cannot say enough good things about it. The pictures honestly do not accurately show how incredible Villa Cascada is. The whole setup of the place is incredible; the pool is right beside the eating/bar area so people can all be together the entire time. There is an amazing upper hot tub area with bar stools and a shaded sitting area where my friends and family loved to hang out. They have a shuffleboard table, ping pong, pool and foosball tables, corn hole and a water volleyball net. They have floats so you can relax in the pool during the day. 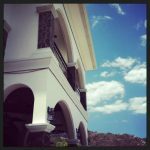 The rooms were all outstanding – big, comfortable beds, amazing bathrooms, and a lot of the rooms had incredible views. 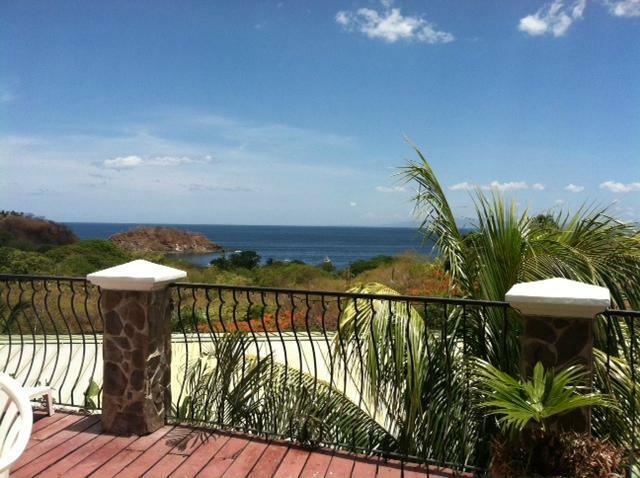 The villa is located on a hill above Playa Ocotal and gets a great breeze and an outstanding view of the sunset. The staff is absolutely amazing. We did not have to think about any logistical things while we were there. The bartenders are AWESOME, all the food was to-die-for, your room is cleaned daily and they even offer free laundry service. Anything and everything you could think of is taken care of for you. 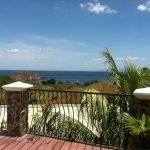 The excursions were great and very easy to plan – we paid the manager the day of the tours so it could not have been easier. We did the Don Bosco sail and the Half-Day Canopy Tour and I honestly would recommend them both. Our sunset was great on our sail day and we even had some dolphins surf our bow! Monkeys joined us for the entire canopy tour and the staff there were awesome and the drive was well organized. 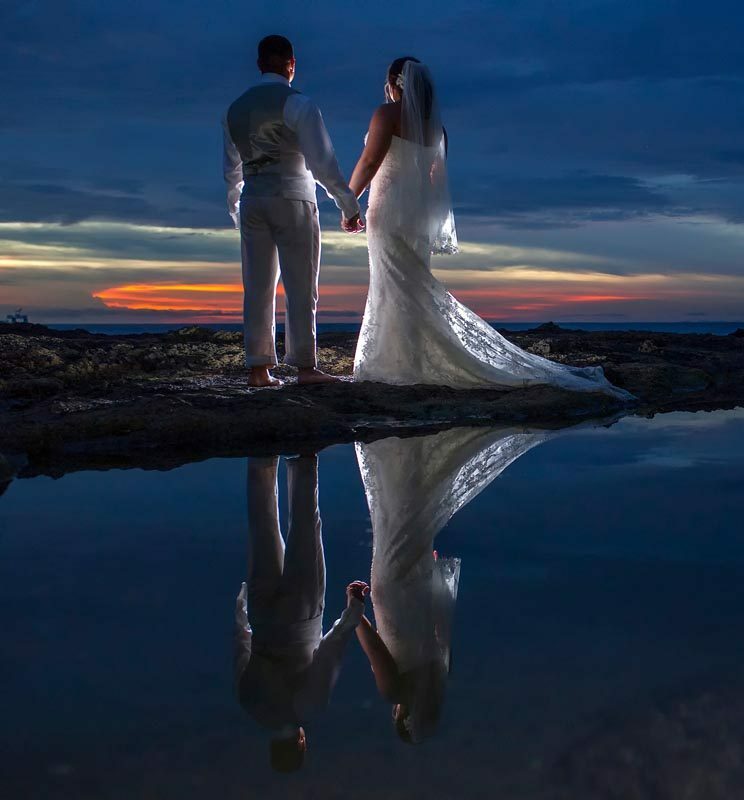 The wedding day was spectacular; it was more than I could have wanted. They change around the layout of the Villa so it honestly seems like a different place than where you have been staying all week. The music system is easy to hook up with your own music and slideshows if desired. 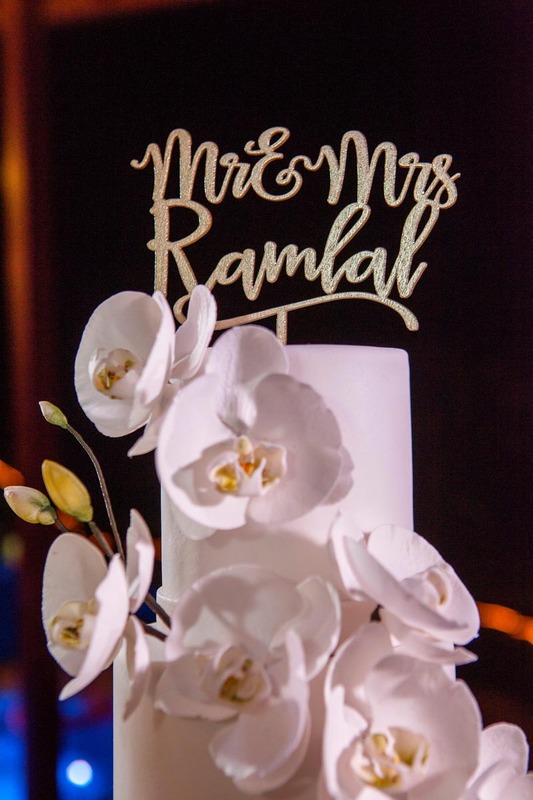 The woman who made our cake (arranged by the wedding coordinators) did a fantastic job and I absolutely LOVED my flowers. The hair and makeup guy and his assistant did an incredible job and we opted for massages for the girls the morning of the wedding; it was one of the best massages I’ve ever had and a great way to start the day. 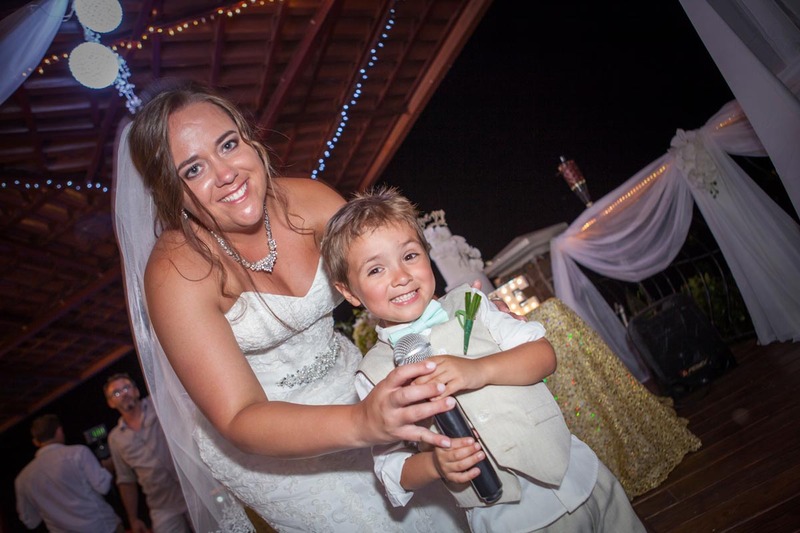 I do not have one bad thing I could say about my wedding day. To be honest, I was a little worried about the price of the Villa for my guests, but after being there I would definitely recommend it. 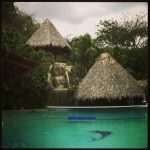 After traveling around Costa Rica I can tell you that food and drinks are not cheap, so the deal you get for the quality you get at Villa Cascada is SO WORTH IT. 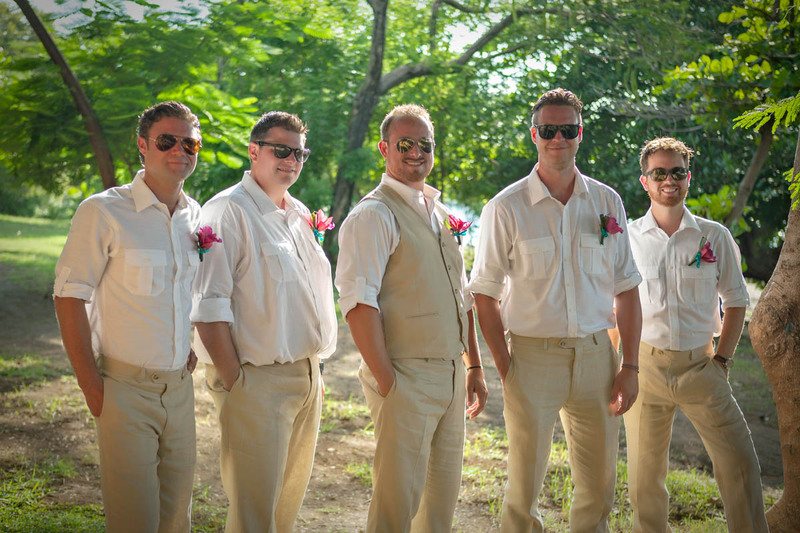 I planned my wedding with the two coordinators while traveling, so I could not have made it more difficult on them. 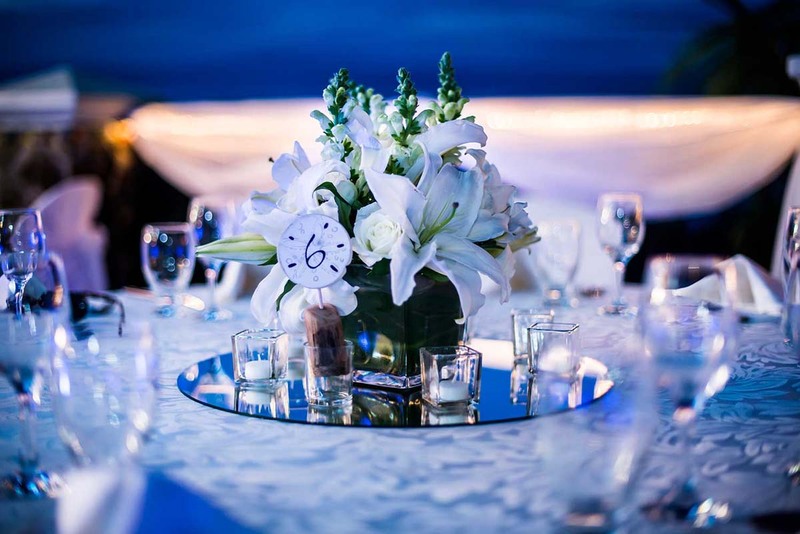 My sister is very organized and kept things going, but you can have them make as many or as few detailed decisions for you as you want. 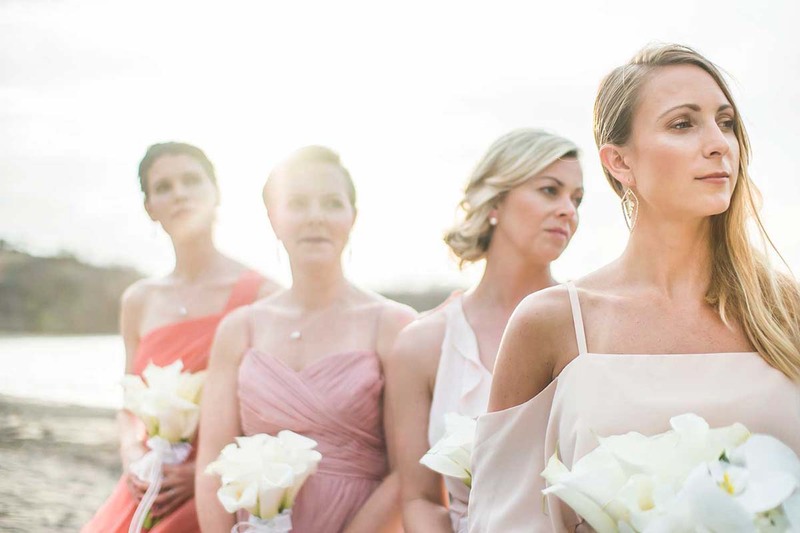 For me, I was not very interested in planning every detail of my wedding and honestly used my sister to help me make a lot of my decisions. I am sure the two coordinators could make more decisions for you if you were able to have phone conversations and more reliable internet correspondence than I was able to have. 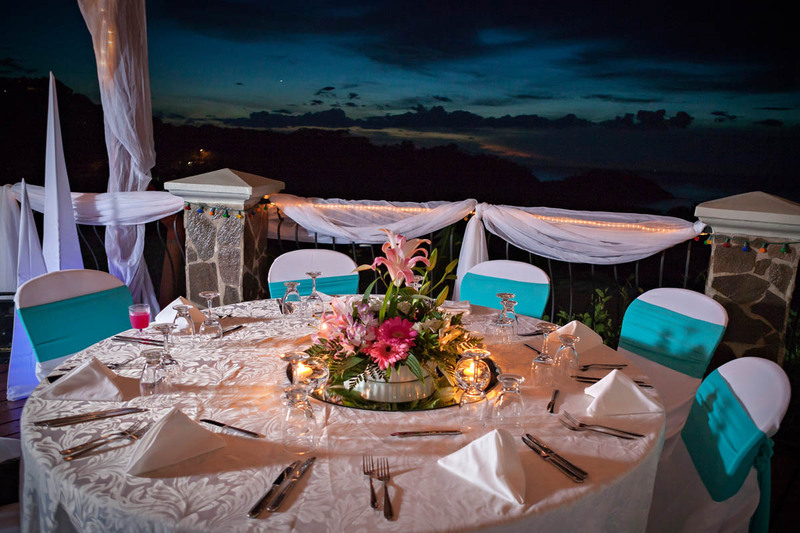 I could not recommend Villa Cascada more highly, whether it be for just a vacation or for a wedding. I absolutely loved it and couldn’t imagine a more ideal place. Wow! What an amazing time my husband and I had at the Villa Cascada! We were guests for a friend’s wedding. We had 22 people in our party and were there for 5 nights. This villa is incredible! From start to finish everything was perfecto! The accommodations were very clean and comfortable. The food was amazing (we never went hungry). The bartenders and other staff were so friendly! Guillermo was so great and helped all of us book excursions. We really enjoyed getting to know Guillermo, as he is very open and shared many stories and valuable information about Costa Rica. Overall the property was really great for our group. We spent a ton of time in the pool, playing games and hanging out. 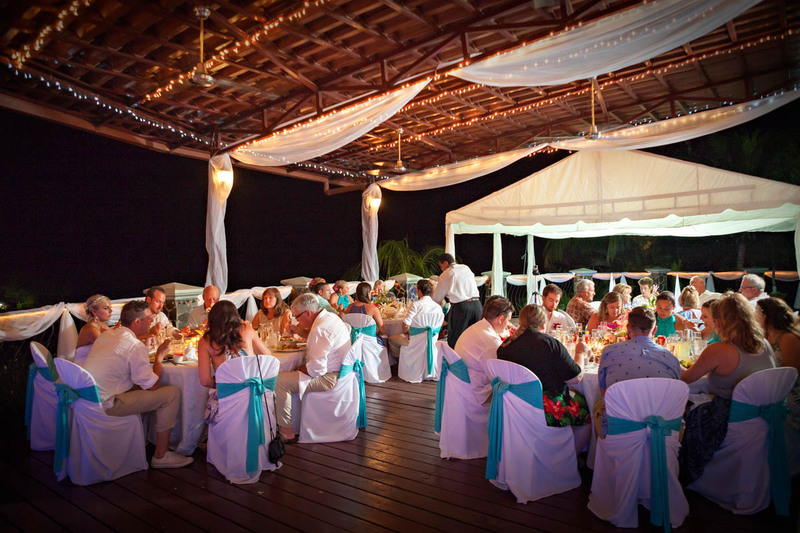 This is such a perfect location for a big family/group, as you can really relax and everything is taken care of for you. Enjoy! !